All of a sudden all of Row 6 and Column 6 are out. Bulbs are good. Reseated J134 & J135. Also Reseated J138. No good. Pin starts and plays fine but having 15 lights not working isn't fun. I have checked wires going into the connectors, all good. I tried to check Q85 & Q93 on the driver board after pulling off J134, J135 and J138. Does the black lead go in the top of the transisitor heat sink hole or the red probe in MM diode test mode? Should I test Q85 and Q93 the same way? Did I pull off enough connectors to test the transistors properly? Has the driver board been worked on previously? Especially examine the right most 20 pin IC in the row with U1, U2, etc. Yes, about a year ago by CoinOp Cauldron. What am I looking for on the IC? Burn? Clive is a good tech, and I don't know the history of the board. But I do know that the data lines pass from component side to solder side by way of the through holes on the right most IC in that row. "Buzz" the traces to ensure that D5 is getting to where it needs to. I don't have the schematics with me or I could give you a better idea of where to look. Clive is a great tech. This is my fault what happened. I tried to put LED's in the game with the power on ever so carefully. And just a tiny little spark when the #44 bulb base brushed a lug to a switch I guess as it drooped while I was grabbing a bulb to insert. Well, look how that turned out...Never again...I knew the risk..and still did it. I pulled the WPC Driver board and started testing transistors. All 8 of the transistors above J137 connector are testing blown for starters. I also noticed that the trough kicker solenoid wasn't firing either. It was working after the short because I played several games on it, then it quit. Clive is a great tech. Agreed...and to be clear to the casual reader...when I mentioned the board history, I meant =before= Clive saw the board. All 8 transistors testing bad doesn't sound right. I suppose it's possible, but unlikely. A logic probe would help considerably. You can track the signals across the board. I used the PinWiki method of using diode test on those 8 transistors and they measure all open. Put black probe on center lug and test both outside lugs with red probe, I get no meter movement. Put red probe on center lug and test both outside lugs with black probe, I get like .563 on one side and .493 on the other side on all 8 transistors. That is a normal reading for that particular kind of transistor. possible broken wire, bad connection in one of the connectors? So is this all I can do with DVM at this point without a logic probe? Tell me again how to 'buzz' d5 ? Continuity check? Can anyone recommend a reasonably priced logic probe for testing? Logic probe should be 20-30 bucks. Nothing super fancy about them.. Thanks! Any guidance on how to test with these for my issue? You need to "buzz" D5 across the board. D5 comes across the ribbon to U1, pin 14. It provides the lamp column and row enable signals for column/row 6. Try this...with the game on, in lamp test, press on U5 firmly. If that "fixes" the issue, you have a damaged through-hole at U5, pin 14. It's best to remove the driver board as you'll need to repair it anyway. Somewhere between all of those pins, you'll find a discontinuity. Then it's a matter of finding the fractured through-hole or trace. The board is out of the game now anyway. I'll pick up a logic probe at Harbor Freight or Radio Shack tomorrow if they have one and report back. You "buzz" between connections with a DMM set to "continuity". This one looks pretty good for the dough.. It does, but I'd rather spend another $10 to get one from American soil, as it'll get here quicker, and it's easier to return/exchange if there are problems with it. I own a Klein Tools MM200 MM. Can't I put it in continuity check with audio and "buzz" the test checkpoints? Or does the logic probe offer something else I just haven't learned about yet, at least for this test? Yes, use the MM to test continuity, see Chris's post, he is suggesting that the solder point, or through hole is loose or damaged, and likely the source of your issue, so make sure you test as he has outlined first, press that connector in, or wiggle to see if the lights come on.. this will tell you if you have a solder or through hole issue. For the tests Chris suggests, even a $10 multimeter would suffice. No need for a logic probe to test where he is sending you, which is a valid first path. Here's what the tests revealed. Yup. I've seen that before, but couldn't find the prior RGP post where I discussed it. U5 must have been replaced at one time, and the trace on one/both sides of the board at U5 pin 14 were damaged. You might get lucky, if you have a good slender iron, by reflowing the solder around that leg just a touch to re-establish the connection. Buzz with your DMM to measure success. If that doesn't work, then if the tech did NOT use a machine pin socket when replacing U5, the proper course of action is to remove the socket, clean up the damage, and install a new socket. If a machine pin socket was used, it's best to not attempt removal. The traces are very fragile and have already been damaged. Use a small jumper to connect U5 pin 14 to U11 pin 2 on the solder side of the board. Yup. Call it a good guess, or whatever, but that's what I thought we'd find. I reflowed the solder on the solder side of U5-Pin14 and I get the "buzz" now at U11, pin 2! The bad news is that I still do not get a "buzz" at U19, pin 7. Whoops. My bad. Typo or late night schematic reading. I should have said U9 pin 4. Try that. I bet you're good to go now. U9 - Pin 4 is buzzing. Gonna pop the WPC Driver Board back in the backbox. Well good news and some bad news after installing the WPC driver board back in and powering up. All the previous lights that were out are now working! Yea! 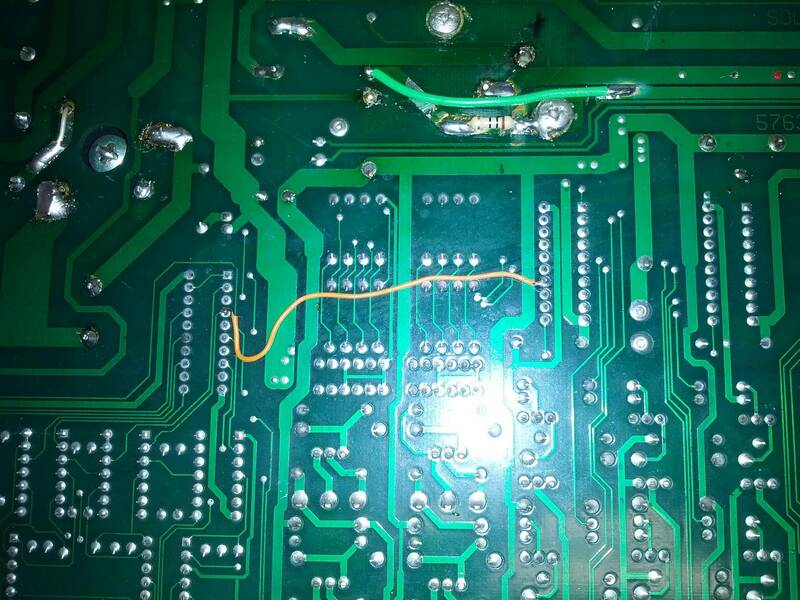 Reseated the connector on the PCB light board under the playfield and the 5 lights came back on! Might need to reflow solder on the pins on that board if it keeps losing connection. Dang these old pins can get finicky! Definitely reflow them. That's SOP for WPC lamp boards...although this is in the S11 section. dialed it in Chris! Game is so much more fun now with all the lights working! You help was greatly appreciated! Thanks for the feedback Cujo...enjoy the game! Dang it! Spoke too soon..
All the lamps in Column 6 on the Lamp Matrix just died while playing tonight. Ya...that still has to be a marginal solder joint. I'll touch it up again. I reflowed it on the component side of the board only before, then buzzed it successfully. So I left well enough alone and never touched up the solder side. If it doesn't hold, I'll run the jumper wire as you suggested earlier on the solder side. Update: I notice when I first turn on the game the column 6 lights all work for about 3-4 minutes before going out together. This happens on attract mode too. and correct it with reflow or jumper wire? Old threads continue to pay dividends... Similar issue turned up here except a different data line. One jumper later the matrix is good again! Which data line was it for you? Thanks Rob. I'm positive that D5 moves from one side of the board to the other via an IC through hole as I tracked down a faulty solder joint causing row and column 5 to not light. I'll have to look at D6 too.